DIA: IS IT REALLY BROKE? I have been asking many questions regarding this millage and Mr. Gene Gargaro, Chairman of the Board of the DIA has kindly answered all of them. 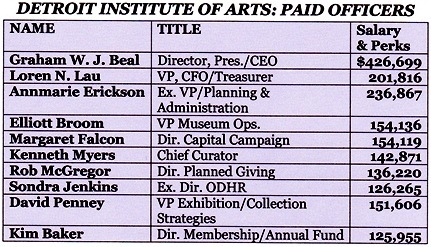 Second, I just cannot wrap my head around the over-bloated salaries of the key employees of the DIA. Yes, I did review the AAMD (Association of Art Museum Directors) salary survey of directors and yes, I did my research on the qualifications directors must possess. However, the Director of the most visited, most recognized museum in the world, the Louvre, makes $120,000 per year. Italian museum directors make even less……why….because these museums are funded by the government (tax dollars) and the government sets the salaries. I am all for people making loads of money here in the U.S., but, when a non-profit corporation asks struggling taxpayers to support over bloated salaries, costly travel accounts, unfunded obligations……..I take great pause! DIA’S MOST RECENT TAX FILING SHOWS HUGE JUMP IN REVENUES FROM PREVIOUS YEAR, WITH LARGE EXCESS OF REVENUES OVER EXPENSES, AND HUGE FUND BALANCE. IS IT REALLY GOING BROKE? 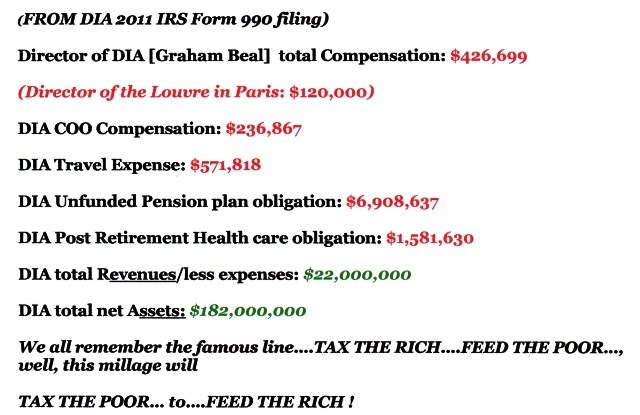 Click on DIA FORM 990 (FILED 2012 FOR 2011) 2010 FORM 990 FY10-11 FINAL to read entire tax filing. This example from Oakland County’s primary ballot shows DIA millage language that will appear with slight variations in Macomb and Wayne. Each county has its own Art Institute Authority and different projected revenues if the proposal passes. (cited in the Grosse Pointe Patch at http://grossepointe.patch.com/articles/august-primary-dia-millage-proposal ). “The three county boards of commissioners this year established separate Art Institute Authorities, allowed under a 2010 state law, to submit the August millage question and monitor the use of funds if it passes. The four-sentence ballot wording (see below) asks for a yes or no vote on a tax “to continue providing art institute services to benefit the residents” of the voter’s county. 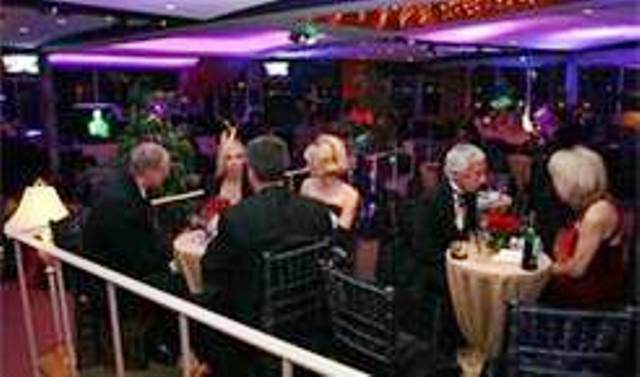 The wealthy elite mingle at the Roostertail during DIA fundraiser. How much is the collection worth? Hi Mark W – that question is unanswerable. Art values are changing all the time and it takes a professional art evaluator an average of a day and a half per object to determine an accurate value. We have 60,000 works in our collection and art prices are constantly changing, not only upwards, but downwards. The real value of our collection is not monetary. Re: value of the collection. Graham is right that it’s impossible to say exactly what it’s worth, but I would think broadly in terms of the current market, in the abstract, the answer is well over $1 billion. Actually, probably several billion. Art museums around the world are filled with treasures that are expensive. 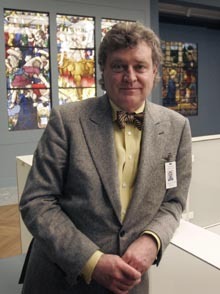 Beal has a very good idea of the collection’s total financial value, I’m sure (the Freep didn’t post my immediate follow-up question of who insures the collection and for how much), but doesn’t want to call any attention to how much Detroit has invested in its art collection — that would raise uncomfortable comparisons with how much a cash endowment of that size would add to the City’s budget. Applying Mark Stryker’s estimate of several billion to typical cash endowment draws implies added cash revenues for Detroit ranging from, say, $75 million dollars per year in perpetuity ($3 billion at 2.5% draw) to $250 million dollars ($5 billion at 5% draw). Applying these revenues to the City budget certainly could make a significant difference for Detroit residents, commuters and visitors. So, why doesn’t Detroit raise money with its DIA art collection? Are its DIA art collection’s art institute services more important than other services for residents, commuters and visitors, like public safety and health, street lighting, blight removal? Does Detroit have to have full ownership of every last item in its DIA art collection, or could it share ownership with investors and collectors so it has its artworks on DIA walls and cash in its arts endowment while those investors and collectors make money if art prices go up. Why is it important that Detroit make money when art prices go up? Detroit hasn’t paid any bills with the billions of dollars it has in the DIA! When Graham Beal says “The real value of our collection is not monetary,” he’s wrong. The collection does have real monetary value. But, monetary value is not its only value. If he said “Our collection has real value that is not monetary,” he’d be right. The collection has both monetary value and cultural value, and they are both real, and both important. In fact, if the collection didn’t have cultural value, it wouldn’t have monetary value. Cultural value is the root of desire, and that desire leads to the monetary value that makes the DIA a very rich institution — with many, many billions of dollars in artworks — and Detroit a very wealthy city, with the potential to generate hundreds of millions of dollars a year in new revenues for its budget by sharing ownership of its vast art collection. 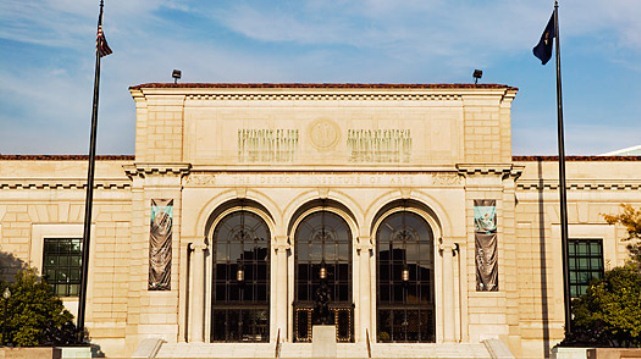 This rich institution should let artworks fund the arts and a whole lot more for Detroit. It should not let its billions of dollars hang idly on its walls when it is surrounded by so much opportunity for the arts and other priority services to make Detroit a better city. Regardless of the rich and elite who get paid six figures to run the DIA, it is a great cultural center of a depleted, depressed, and desperate city. Art can open the eyes and soul of any person, whether wearing cashing 6-figure checks or cutting coupons. This city and metropolitan has suffered enough despair over the past decade. Losing an amazing oasis of art, peace, and serenity should not be added to the list. Also, you failed to mention that in Paris, museum directors, or any other professional or Joe Schmoe, don’t need to make comparable salaries to Americans because they don’t have to worry about selling an arm to cover their medical bill for a broken leg, rather basic necessities, such as health care, are provided for, as are the arts, in those countries. But hey, we are capitalists. So this is the price we pay. I personally don’t think that (on average) $15 a year per homeowner is much to ask to keep the arts alive in Detroit. I guess I’ll be the boring person and agree with you WHOLLY on your assessment. This culture of elitism where people fund the most mundane and unneeded services over those that are essential and tout the reason because they are cities and it “helps the culture” is a load of crap. If they really needed the funds, why didn’t they use Kickstarter and raise the funds for Private individuals to fund the museum , rather than force the locals to fund a rich person’s pleasures while many lie enslaved under the auspices of Welfare and other socialist policies? That, right there , is an inherent problem. Instead of going to a viable option , the elitists expect us to pay for their panem et circuses while we wallow and toil and suffer in the fields of slavery and oppression. And all for what? I doubt anyone will get free admittance for OUR funds being put into a private institution. Let’s hope this all falls apart and the DIA is closed forever and shut down.There goes me ever going to that pile ever in my life time and I urge others to do the same.